Something quick to make up for summer weather (whenever it gets around to happening). 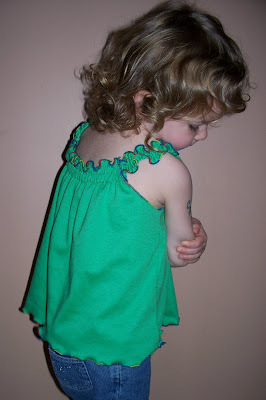 A girly variation on a classic tank top, that is just as simple and quick to make. The top I've made up here was done in jersey knit fabric, but I've found that woven fabric works just as well, though you have to scale up your sizing to compensate for the lack of stretch. 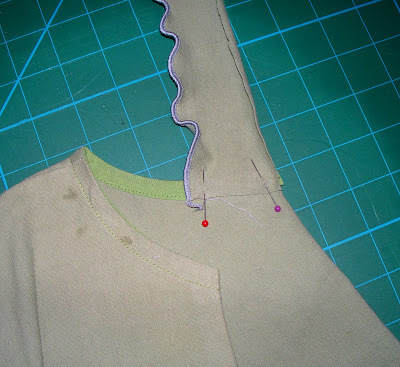 If you are using knit fabric, remember to use a rounded tip needle to avoid tearing the fabric. 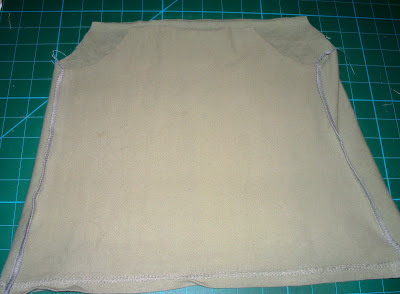 The top I've made as an example for this tutorial was cut out of an old stretched out tee shirt and I've used the finished bottom edge as my bottom edge (always a bonus with knit).This top also uses lettuce edging. I've used the rolled hem setting on my serger (interlocker) to do lettuce edging on the knit by turning the differencial feed to low as it goes. 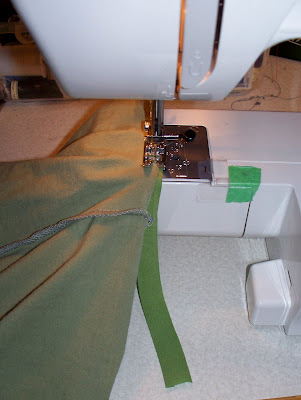 To do lettuce edging without a serger, use a zig zag stitch to finish the edge of the material while stretching the fabric. 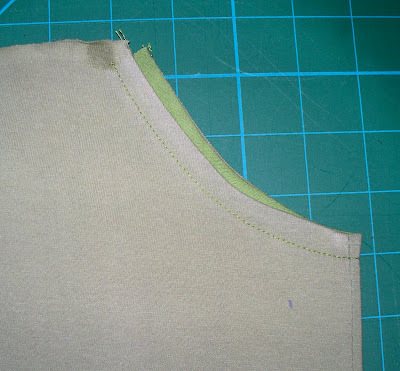 Practice a bit before you start on your garment to find the width and length of zig zag stitch that appeals most to you. 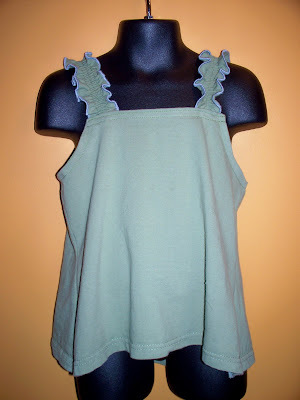 For this top, the front piece fits or is the same size as a regular tank top, minus the shoulder straps. I suggest using an existing tank top that fits well as a basis for sizing. The back piece is in the same shape as the front, but a few inches wider. It will be gathered with shirring to fit properly. The straps should be approximately one and a half times larger then you would normally want. 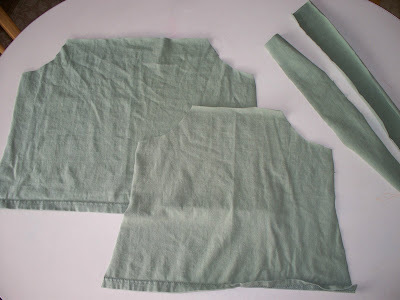 Cut these long, though, because you will be able to fit them at exactly the length you want and shirring does make exact dimensions hard to determine. For width, I've made my straps about 2" wide for a child's size 5/6. 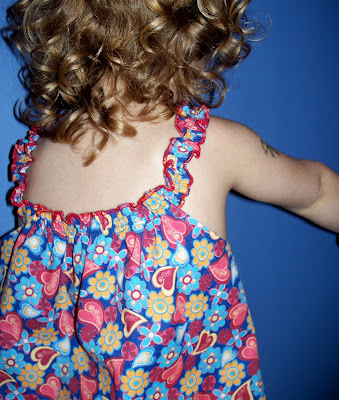 I wouldn't change this width too much, though, for any size - adults will most likely want a proportionally smaller strap than a child, lest ye end up looking like you have wings sprouting from your shoulders. I've made this one pattern piece for both the front and back pieces. To get the back piece, I cut around the pattern. 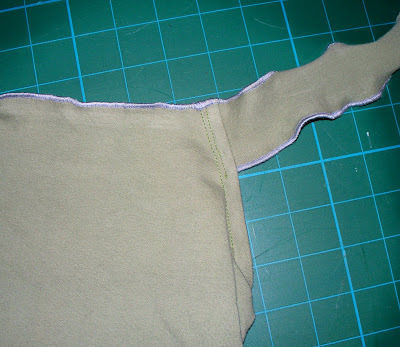 To cut the front, I fold on the dotted line and cut around the remaining pattern. Turn the bias tape right side out and press. 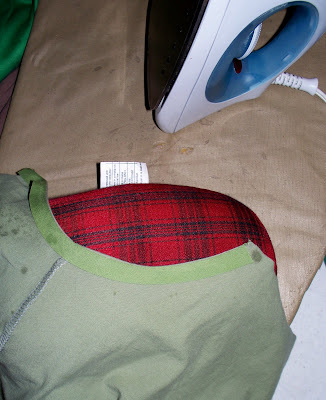 When pressing knit, do not move the iron back and forth but press one section, lift the iron, and then press another. 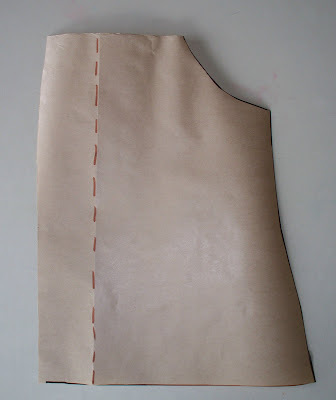 Make use of a dress maker's ham if you have one - much friendlier for these curved areas. If you still find the knit becomes a bit out of shape, hover the iron about a 1/2" over your stitching and use steam to reshape the fabric. Stitch again about 1/4" or 3/8" to finish the hem. 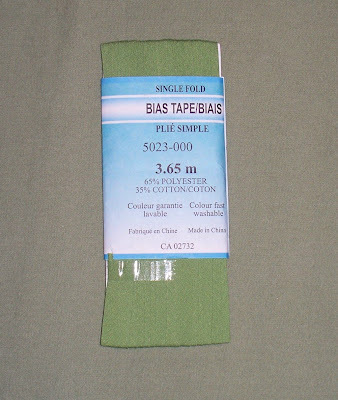 Again, place the bias tape on the bottom while you stitch. 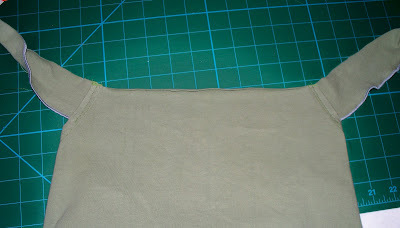 Next, hem the bottom of the top with either a regular folded hem or lettuce edging. 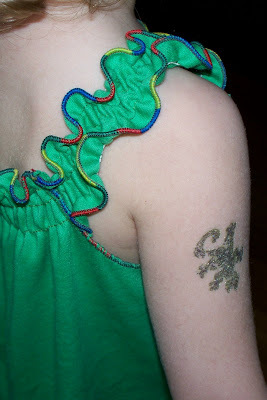 Finish the top edge of back piece and the straps with your lettuce stitch, treating it as one long edge. Now that the straps are in place, replace your bobbin thread with elastic thread and shirr along the straps and the top of the back piece, again treating it as one long edge. If shirring is new to you, there is some instructions here. I like to do three rows of shirring, with the first row down the middle of the straps (and same distance from the top edge of the back piece) and the next two rows on either side of the first at even distances. Once the straps and back are shirred to your liking, the front piece top needs to be finished before the straps can be attached. 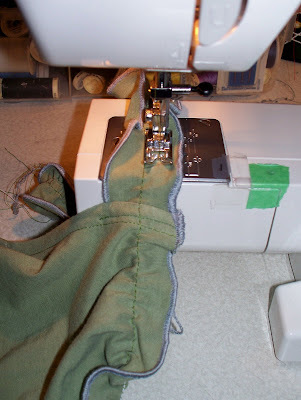 For mine I like a simple double folded hem, using the bias tape as a stabilizer on the first fold. With the front top edge finished, check the length of the straps for a proper fit and then stitch them in place along the top edge. And that completes the top. This is a free tutorial and I encourage you to use the information in any way you need to (check the disclaimer at the bottom of the page). If it works for you, please consider supporting my etsy shop by purchasing a Little Print Design pattern or toss a dollar or two in my paypal to show appreciation and to encourage me to offer up even more quality patterns and tutorials. Questions about the Donation? FAQ here. one question...how did you cut out the straps? across the old shirt or up and down? I've done both. 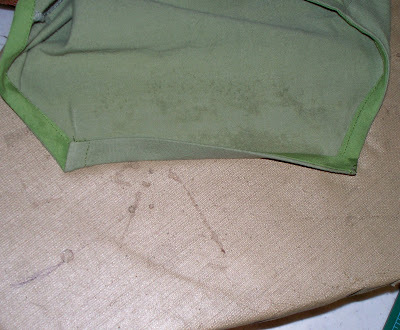 Up and down gives you a nicer lettuce edge, but generally it doesn't affect the shirring much. Thanks! I'm making one of these for myself! Thanks so much for the tute-I made a shirt for my daughter tonight and it turned out great! I pop in from time to time to see what's new. First, I love that you are doing this, very nice of you and quite fun. 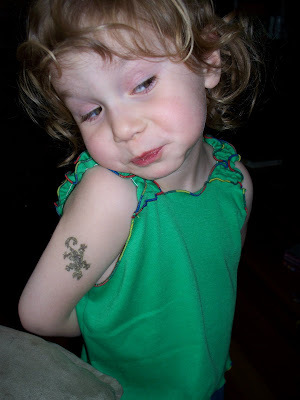 Second, your 'model' is so stinkin' adorable! 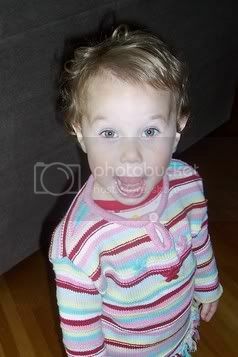 She just cracks me up, what a personality! Thanks for the tute, I'll have to give that one a try for my daughter this summer. You have the bestest stuff. and what happends when u dont have a serger to make edges so nice? hi,have a question. how long about the shirred tape after sewn? i pop here once in a while. for the last pic, how do you make it all curved. it looks almost like a yoke top dress. anon, generally shirring leaves a strip of fabric at 1/2 size when the elastic is relaxed, though it depends on your machine, size of stitch and type of material. The straps are attached at the sizes rather than the top on one side of the top... they do curve out and up nicely. I haven't tried making this yet, but I wonder how it would look/fit if the front was identical to the back? 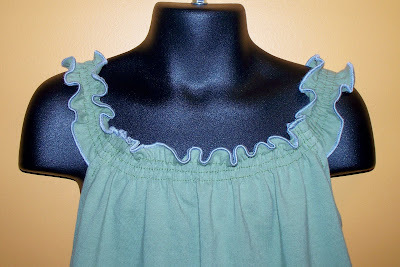 I like the shirring and the way the straps look attached at the sides giving it the rounded effect.